Little did I realise that I would not be able to do my usual posting. My ladder fall at the start of October was the beginning of having my whole house painted which caused major disruptions. 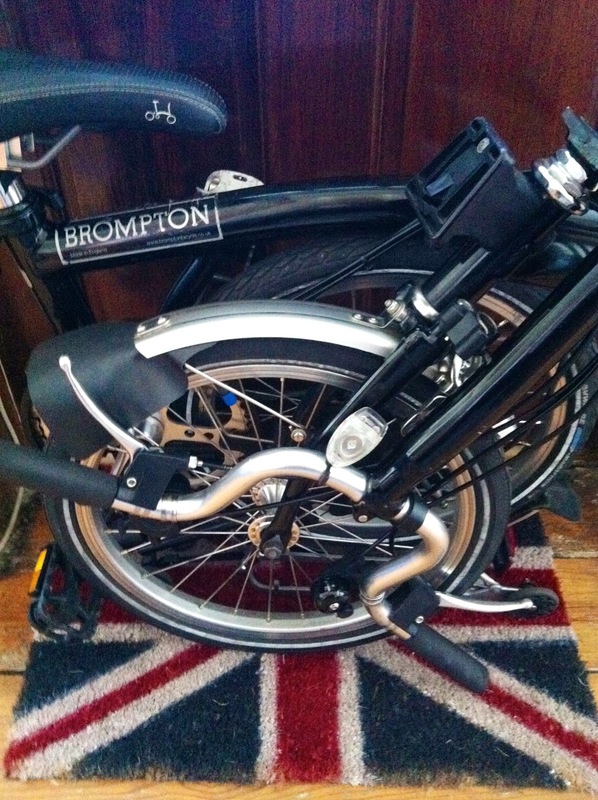 The poor Brompton got covered in plaster dust until I got it under some plastic. I had limited access to broadband and just having a clear space to work. I discovered that having your house painted is the equivalent of the pain of moving house but you don’t go anywhere. Work was very busy with extra long days at the start of November and this week it was confirmed that my ladder fall had caused a small tear in the retina of my right eye and I had laser eye surgery to fix it yesterday. I had my Brompton with me at the opticians in Covent Garden when I was told that I had to go straight away to Moorfields eye hospital. The Optician asked if I was going to cycle and I reassured her that I would be going by underground which I did. Once again I am very grateful for the flexibility of a folding bike. After being seen by the consultant and told to go home rest and come back tomorrow for surgery he saw the Brompton and asked me if I was going to carry it as he had just advised me not to do any heavy lifting. I had to demonstrate that I could push the bike along before he would let me go. With blurry vision I travelled with the Brompton back home to South London by public transport and walking. Wheeling the bike meant I was able to stabilise myself. My sight is not affected and I am able to drive and cycle now the eye drops have worn off. But I have to go back tomorrow to see if the treatment worked. So it will be brief posts over the next couple weeks. My best wishes for a full and rapid recovery. You have certainly been in the wars lately. Hope that you are fighting fit soon, riding your Brompton and writing about your travels on your blog. A cautionary tale of home decorating! I wish you better, and hope you're back to normal soon. I had my Brompton serviced last week, and what a difference it makes - crisp to ride again, even in these cold, misty mornings. Not cheap, but cheaper than a new bike, which it feels like now. Sorry to hear about your accident and hope you are on the mend. Love the blog and look forward to your updates. Oh My! Wishing you a speedy recovery, and lots of lovely rides soon! i wish you a speedy recovery and all the best.